As a wedding photographer, I have experienced many venues that create beautiful Philadelphia wedding photos including the Spirit of Philadelphia, American Swedish Historical Museum, Cescaphe Event Group, Regal Ballroom, Bok, Sofitel Philadelphia, Hotel Monaco Philadelphia, the Racquet Club of Philadelphia, the Olde Bar, and Loews Philadelphia Hotel. The city of Philadelphia is lively, colorful, and full of art and history. It possesses a richness and allure that one cannot find in any other city. There is no question that the “city of brotherly love” is the perfect place for a couple to celebrate their wedding day. The wedding pictured above was held in a boutique-style wedding studio located in Old City, Philadelphia. Old City is a neighborhood in Center City, Philadelphia that is ideal for Philadelphia Wedding Photos. The area is adjacent to the Delaware River and is said to be near the place where William Penn and the Quakers first settled. This area of Philly is overflowing with historical sites, some of the most notable of those being Independence Hall and the Betsy Ross House. In the image from the Old City wedding pictured above, the bride and groom share a lively dance with family and friends surrounding them. 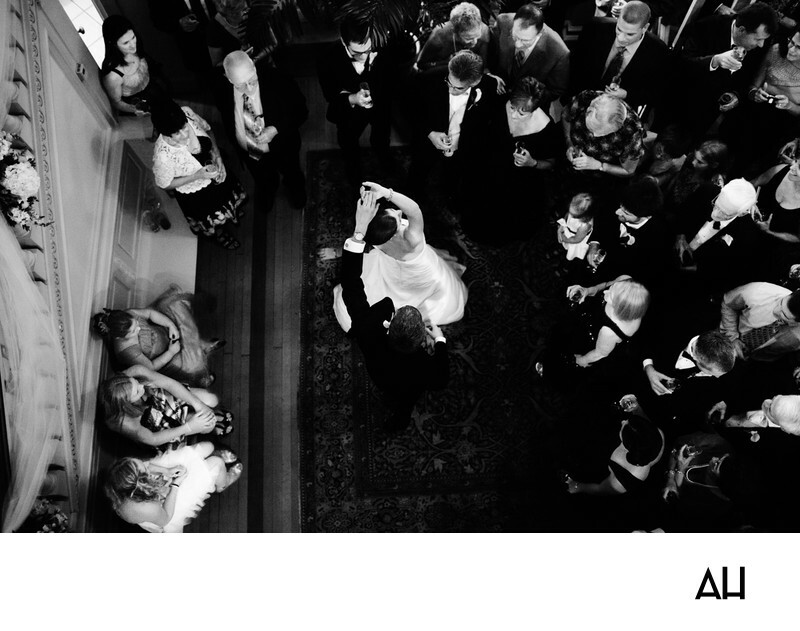 I took the photograph from above the couple and their guests to really capture the movement and life of the image. The black and white coloring of the image focuses attention on the bride and groom. The groom takes the hand of his wife and twirls her around as loved ones look on. The swirl of the bride’s white dress is highlighted over the dark designs on the oriental rug beneath her feet. This is the couple’s first dance together as newlyweds, and it is a moment they will surely cherish forever.